Could you climb the height of Everest in a year with Trail magazine? Everest is 8848 metres tall. That’s 29,029ft – the cruising altitude of a 747, the bottom of the stratosphere... and several vertical miles higher than anything in Britain. A pretty epic challenge! But actually, if you add up all the ascent with every hill you climb, you could find that you’re on the way to reaching the height of the world’s highest mountain. So why not take the Trail magazine challenge? Do it to get fit, do it for charity, do it to feel happier and healthier – but most of all, give yourself a goal to get out into our most beautiful places – the hills and mountains of Great Britain. Climbing the height of Everest is free and simple. 1. Sign up here to join the challenge and get access to your milestone cards. 2. Download your Progress Tracker. 3. Start walking and measure your ascent using a mobile app, Viewranger, Os Maps, a fitness watch or GPS device, Trail Magazine Routes or a simple map. 4. Add up all your metres of ascent on your Progress Tracker. 5. Join the Trail Everest Anywhere community on Facebook and keep us up to date of all your adventures and achievements! Or hashtag #EverestAnywhere You might even see yourself in Trail magazine! 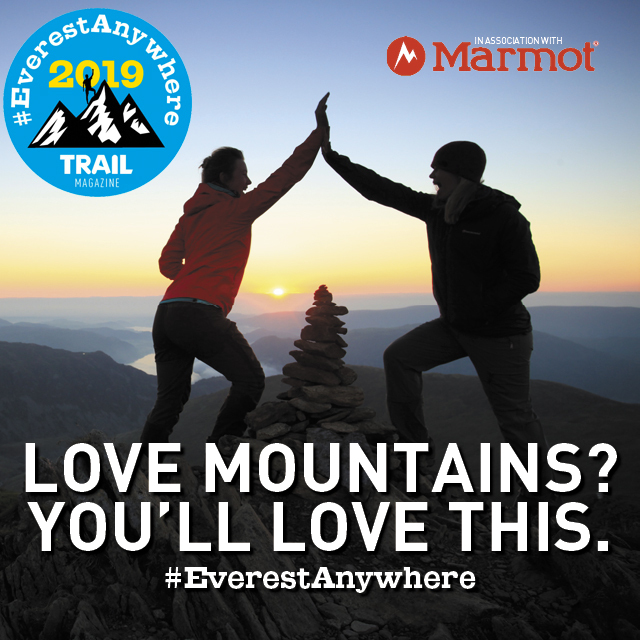 Look out for exciting competitions from challenge sponsor Marmot along the way!